Minox binoculars offer a lot for your eyes: a superb design with extremely high-resolution lens systems. The use of special glass increases the contrast, so that the user is able to recognise small details even under critical light conditions. All Minox binoculars are made of multicoated lenses. For this reason reflections are reduced and the observed results are much more brilliant. The MINOX engineers directed their attention towards an extremely short focussing distance so that even small objects can be observed from a close distance. The sturdy and extremely light weight body made of aluminium offers the necessary stability, so that the new MINOX binoculars may be used with confidence in extreme outdoor activities. MINOX’s utmost aim was to ensure performance at the highest level when they designed and developed the new HG binoculars. Our German engineers designed High Grade Sport Optics aimed at the best possible performance in all areas. The newly developed optical system provides a fascinatingly high light transmission, gaining top marks for brightness and contrast. With their sleek body design and magnesium housing, the new HG binoculars are real top of the range lightweights, beautiful and ergonomical. The innovative FCF focusing improves operation. For the first time it is possible to take exact distance readings from a scale on the focusing wheel. Special optical glass from the German specialists, SCHOTT AG guarantees excellent optical quality. With these features the new MINOX HG’s are today’s state-of-the-art with all the potential of becoming tomorrow’s classic. The Minox Open Hinge BL BR Binoculars have been created to offer superb optical performance in an ergonomic and robust package. The Open Bridge design of the binoculars enables safe and reliable operation, even single-handed, allowing more freedom to move when out in the field. Field of view on the Minox BL BR Binoculars has been improved by 16% over the previous models and the polycarbonate body is rubber armoured to keep it sturdy yet lightweight. The phase corrected roof-prisms in combination with the multicoated lens elements guarantee the best optical performance and neutral colour rendition of the object in view, providing high detail and sharp contrast, even in low-light. Nitrogen filling and sophisticated sealing technologies keep the Minox BL BR Binoculars fog-free and waterproof to 5 metres while rotating rubber eyecups with individual adjustment and long eye-relief are further convenient features. 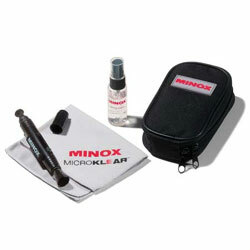 The Minox BLs come complete with soft pouch case, strap, rainguard, objective lens covers and lens cloth. The Minox Open Hinge BV BR Binoculars have been created to offer superb optical performance in an ergonomic and robust package. The Open Bridge design of the binoculars enables safe and reliable operation, even single-handed, allowing more freedom to move when out in the field. Nitrogen filling and sophisticated sealing technologies keep the Minox BV BR Binoculars fog-free and waterproof to 5 metres while rotating rubber eyecups with individual adjustment and long eye-relief are further convenient features. The Minox BVs come complete with soft leather pouch case, strap, rainguard, objective lens covers and lens cloth. The MINOX BF binoculars stand out with the renowned design and performance features with an outstanding price/performance ratio. With their state-of-the-art optical systems the BF guarantee outstanding viewing quality and are excellently suited for universal application in all observation of flora and fauna. These systems feature multicoated lens elements that minimize reflections and provide an exceptionally high light transmission as well as neutral color rendition of the subjects in view. Thanks to roof prisms with phase-correction coating the user can enjoy an image with excellent detail, rendition and high image contrast - even in low light conditions. The excellent grip provided by a rubberized coating make the BF binoculars comfortable and ergonomic to hold without causing fatigue. Furthermore the color has been changed from green into black. The sturdy aluminum body guarantees reliable functioning of the optical systems and precision mechanics that are protected against dust and water using an innovative sealing technology. The new Minox BFs come complete with soft leather pouch case, strap and rainguard. Lenses from Minox are high value masterpieces of optics and precision engineering. With the optics cleaning agent, Lens Pen with dusting brush and microfiber cloths contained in this set, you can keep your lenses in top condition.